This recipe roughly follows the Seattle-based Marge Granola formula as it appeared on The Kitchn’s website, so if you lack the time or inclination to make your own granola you can just click that link above to order some seriously tasty granola from Megan (who also, by the way, writes the lovely blog A Sweet Spoonful–see you over there!). But I imagine that if you are reading this blog you are, or aspire to be, a granola-making type, so let’s do it. Maple Granola with Almonds and Coconut: In a large bowl (I use a big pot, actually), combine 6 c. rolled oats, 2 c. sliced almonds, 2 c. pepitas, 1 c. sunflower seeds, 1/2 c. sesame seeds, 1 Tb. kosher salt, 1 tsp. ground cinnamon and 1 tsp. ground cardamom. Stir well. Add 1 c. olive oil, 1 c. maple syrup, and 2-3 tsp. vanilla and stir again, mixing thoroughly to make sure that the dry ingredients are thoroughly coated. Spread granola across two big rimmed baking sheets and bake in the top and bottom thirds of the oven at 350 degrees, stirring and switching the trays every 10-15 minutes. Add 1-2 c. large coconut flakes or ribbons after 30 minutes. Bake 40-45 mins. in all, until the granola is toasty brown. Allow to cool completely, then store in an air-tight container. Note: I am cooking for a full house so, as usual, I made a big batch and ended up with just over a gallon of granola. You can halve the recipe if you must, but why not make it all and freeze half? 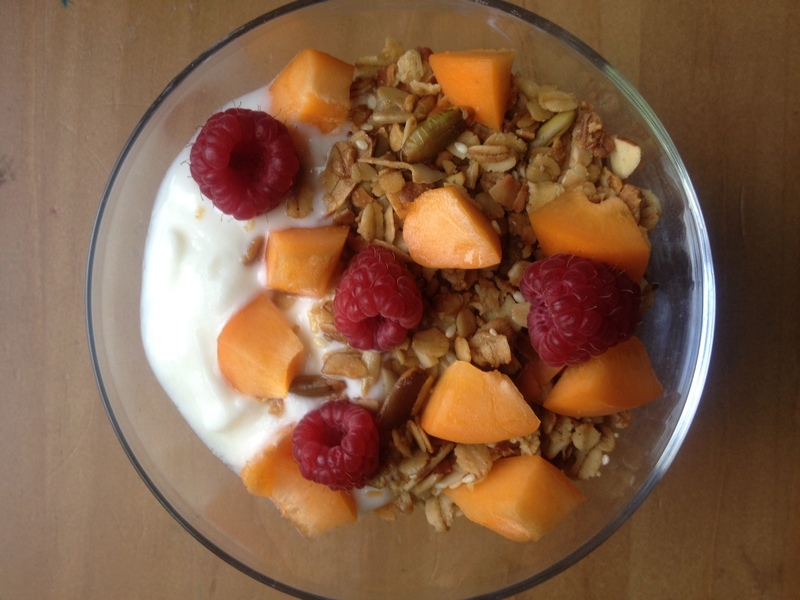 This granola sounds great – healthy and decadent at the same time! I must try my hand at this one of these days! I did have a quick question: is it ground cardamom? I am assuming that it wasn’t whole pods . . .
PS. I did your cardamom pods in coffee trick. Oh my gosh. SO GOOD!!!!! Thanks for the suggestion, Emmy! Spiced up coffee rules! I am going to spread the gospel! I do love granola and this one sounds divine – love your addition of sesame seeds, too. And thank you for the tip to freeze granola!